DALLAS (CNS) — Cardinal-designate Kevin J. Farrell is having a busy year. He had been the bishop of Dallas since 2007 but moved to Rome Oct. 6 to begin his new role as prefect for the Dicastery for Laity, Family and Life, only to find out three days later that he would be one of 17 new cardinals elevated in November, joining two others from the United States. Earlier this year, Cardinal-designate Farrell, had been vocal about the need for better gun control and then in July, he was among several religious leaders who delivered a prayer in Dallas the day after five Dallas-area police officers were gunned down as they were protecting people protesting fatal shootings by officers in other parts of the country. “I am humbled by the news this morning that our Holy Father Pope Francis has named me to the College of Cardinals. I ask all in the Diocese of Dallas to please pray for me that I may to the best of my ability fulfill this sacred duty to our church,” he said in an Oct. 9 statement. The 69-year-old cardinal-designate was born in Dublin and as ordained to the priesthood in Rome as a member of the Legionaries of Christ in 1978. He was later incardinated as a priest of the Archdiocese of Washington, where he served in several parishes before he was ordained an auxiliary bishop for the archdiocese in 2002. In 2007, he was named to head the Diocese of Dallas. During his nearly 10 years in Dallas, the cardinal-designate was outspoken not only on gun control but abortion and the death penalty, immigration and religious liberty. The diocese also has had an increase in priestly vocations and steady Catholic school enrollment during his tenure. When the cardinal-designate was named to his new post at the Vatican in late August, church leaders in Dallas had plenty of praise for him. That praise has been echoed in reaction to the announcement of his new role as cardinal-designate. Father Tony Lackland, pastor of All Saints Catholic Church in Dallas, said he heard the news through a Google Alert online Sunday morning. “I was surprised about the timing, but not surprised. The Holy Father has great faith in him and he is where the Holy Spirit is calling him to be. I’m just so excited for him,” he told The Texas Catholic, Dallas diocesan newspaper. The priest described Cardinal-designate Farrell as a mentor and leader. He noted that the cardinal-designate shared a meal with more than 130 diocesan priests before heading to Rome for his new assignment. “When we had this last gathering with priests at the seminary, there were tears in the eyes of some of the priests because he has really touched our lives. He really cared about us as clergy,” the priest added. He said there was applause when he announced to the congregation at Oct. 9 Masses the news that their former bishop had been named a cardinal. “When the word went out about him becoming a cardinal, all of the reactions were ‘awesome,’ ‘wonderful,’ ‘not surprised,'” he added. 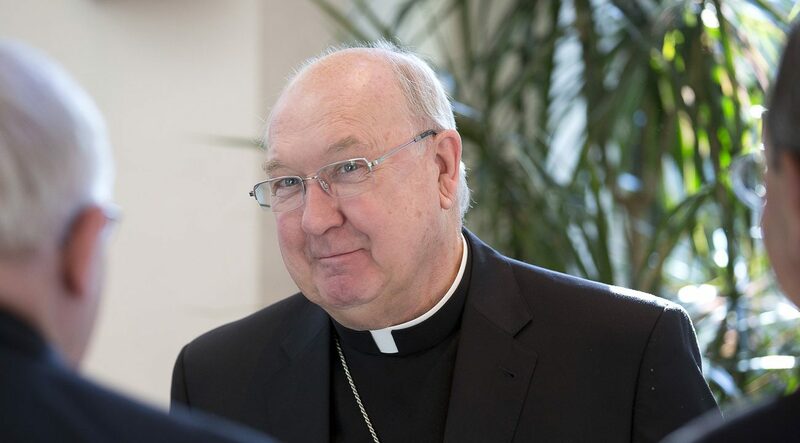 In a statement in August about his role heading the Vatican’s new office for laity, family and life, then-Bishop Farrell said he had “mixed emotions” about leaving Dallas, its people and priests. With his Vatican appointment, the cardinal-designate joins his brother, Bishop Brian Farrell, who is secretary of the Pontifical Council for Promoting Christian Unity. Cardinal-designate Farrell also was in the news in 2014 when Dallas city and county leaders asked him if the diocese could house a family that needed to be quarantined because of their exposure to an Ebola patient, who later died. For more than a month, four people who were members of a Baptist church were housed in a bungalow in the Catholic Formation and Conference Center in southern Dallas. Seth Gonzalez contributed to this story.